CSMlearn is a Public Benefit Corporation committed to empowering people around the world to reach their full potential in their education, in their careers, and in their lives, being particularly mindful of those who are underserved. As a Public Benefit Corporation, we are committed to maximizing our benefits not only for our shareholders, but for all of our stakeholders: owners; employees; users of its services and products; business partners and suppliers; the local communities in which it operates; and its home, the earth. CSMlearn is proud to be a Certified B Corp®, which means that we have passed a rigorous assessment to ensure that we meet the highest standards of verified social and environmental performance, public transparency, and legal accountability. We join 2140 companies in 50 countries and 130 industries who are trying to make the world a better place by incorporating social impact business best-practices. Click here to see CSMlearn's complete report, or here to learn more about B Corps. Every member of the CSMlearn crew (programmers, curriculum developers, customer support staff, expert coaches, business development people, and more) has a deep personal commitment to changing the ways that things are done and helping as many people as possible. We are a relatively flat organization, and everyone works for and with everyone else as needed. We make decisions mainly by consensus, ensure that any lingering doubts are taken seriously. We don't believe in sunk costs, and if something isn't right we keep plugging away until it is. 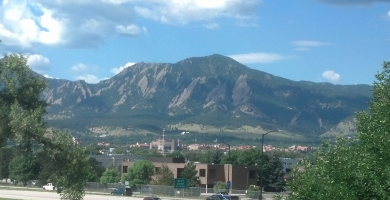 CSMlearn's offices are simultaneously energetic and relaxed, with recliners, Foosball table, snacks, enthusiastic conversation, and a beautiful view of the Boulder flatirons. CSMlearn was founded by two high-tech entrepreneurs, David and Marty Goldberg. David is a molecular biologist with a BS from Yale, a PhD from Caltech, and postdoctoral experience at Harvard and University of Cambridge. He was one of the first people to put a gene/DNA back into a higher organism - in his case, curing alcoholism in a fruit fly (have you ever seen a mean-drunk fly?). He later did a postdoctoral stint at the University of Colorado, Boulder in artificial intelligence, and then founded a series of high-tech companies in geophysics, optical networking, hot-melt glue, streaming audio, automated indexing of images using facial recognition, and more. Recently, he invented a rapid test for bacterial antibiotic resistance, which could potentially save tens of thousands of lives a year. Marty has a degree in biology from Earlham College, and a Masters in Library Science (for biomedical librarianship) from UCLA. She created one of the first biotech commercial libraries, and has partnered with David in many of their entrepreneurial ventures.